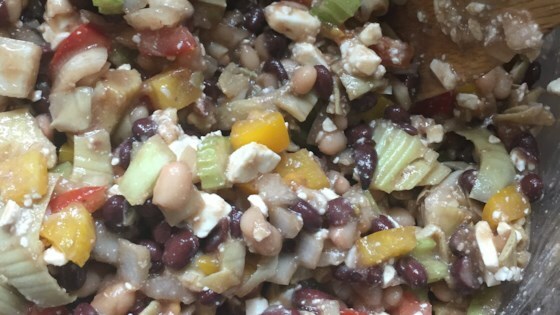 "This is a tasty bean salad that is actually good for you!" Sorry, just wasn't crazy about this recipe. I did not use marinated artichokes - maybe that would have added more flavor. This was delicious and made a nice side dish for grilling. I used un-marinated artichoke hearts for a healthier dish and green onion for color. I certainly recommend it! This salad was excellent. I made it for a pot luck at work and was asked for the recipe by tons of people. The feta cheese is a great addition. This dressing really hits the spot! And I like to add black olives and tomatoes. Really nice.